Wild Fire Riches is a bright and vibrant video slot from the leading software developer, Ainsworth Gaming Technologies. This release of 2015 is packed with everything you may look for in an online video slot. To make it more attractive, the developer has used red hot flames on the edges of the reels that will hit up the action and warm your chances of walking away with a huge prize. The game has a newbie friendly bet range of from as little as $0.01 up to $100 per line, and a theoretical return to player of 94.13%. Wild Fire Riches video slot comes with several symbols and special features like whopper wilds, mega whopper wilds, and the Free Games Feature where you will be rewarded with eight free games to start with. The graphics are superb and the gameplay flawless, just as you expect from Ainsworth Gaming Technologies. Wild Fire Riches video slot is compatible with major gaming platforms including all smartphones and tablets running on iOS and Android systems. Also, you can choose to play this fantastic slot either in free play or real money modes. If you are a lover of classic theme video slots, then prepare for some great gaming time with Ainsworth Gaming's Wild Fire Riches. The visuals in this game are great, and as you expect, everything is sizzling hot. The reels are arranged on a simple layout of 3x3x5x5x5 and set against a retro style bright colored background with flames of fire rising from below. All the symbols maintain the fiery look such as the burning dice, burning dollars, a pot of gold cooking on the fire and burning rings. The sound effects of the game are reminiscent of the traditional brick and mortar casinos and will keep you immersed throughout your gaming time. If you have been playing video slots from Ainsworth Gaming, you will agree that they feature simple and straightforward rules. Nothing much has changed in Wild Fire Riches except for the reel format, where two reels have three rows, and three reels have five rows. All the reels and rows benefit from the 100 pay lines which pay from the leftmost to the rightmost reel. You can stake from a minimum of $0.01 up to a maximum of $100 per line. You will find the Spin button in the bottom left corner of the screen and the Autoplay button adjacent. Click on the (+) Autoplay sign to play a maximum of 100 spins uninterruptedly. There is a Gear icon at the bottom left of the screen where you find a panel with the settings to adjust your bet and pay lines. 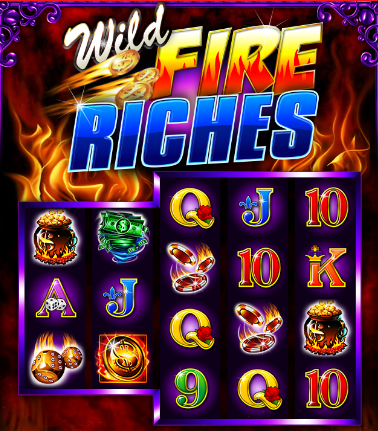 Wild Fire Riches slot has different symbols that maintain the sizzling nature of the theme. Joining the low paying symbols are represented by the standard card letters Q, J, K, A, 9 and 10. Keep your eye on the pots of gold coins, poker chips, dice, dollars and a casino chip for they represent the high-value symbols. The Diamond is the wild symbol and will substitute for all other symbols except the scatter symbol and the Whopper Wild. The Whopper Wild symbol will land only on reel to turn reels 3, 4 and five into a large wild. The Scatter symbol in the game is the Wild Fire Riches logo. Landing 3, 4 or 5 of the kind anywhere on the reels will reward from 1x, 10x or 100x your initial bet. The Scatter symbol will also activate the Free Games feature and reward you eight free spins. The eight free spins will be played on a new set of giant reels where the low paying symbols are excluded. Your prayer during this game is to see the Mega Whopper Wild symbol on reels to transform the symbols on the giant reels on the right-hand side and match the two symbols that land on reels 1 and 2. Land three Wild Fire Riches scatter symbols during the free feature and 2, or more free spins will be activated. 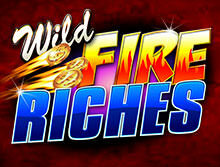 Play Wild Fire Riches Slot on the Go! The mobile version of Wild Fire Riches slot is impressive, just like when playing from the desktop. Ainsworth has utilized new technology such as HTML5 to produce fine graphics and smooth gameplay on Android and iOS devices. The interesting thing is that you dont have to worry about saving unknown applications or software on your smartphone or tablet as it was available in instant play mode. You will play it directly through any standard mobile browser like Chrome, Firefox, Opera, and Safari. For more than two decades, Ainsworth has been supplying the casino gambling market with thrilling slot games. The company boasts of two Master licensed from recognizable authorities in the market, the UK Gambling Commission and Alderney. Ainsworth began by developing slot machines for the land-based operators before moving to the internet world. Their video slots are characterized by stunning graphics, special features and symbols not mentioning unique themes. You can play their games at some of the most reputable casino sites in the UK such as bCasino. There is no other place to feel the heat brought by Wild Fire Riches than here at bCasino. We have a modern online casino site with a sleek interface, which makes it easy to navigate for new players. You dont have to worry about your safety; we utilize the latest 128-bit Secure Socket Layer (SSL) encryption software to ensure that all your personal information and online transactions are safe. We are also licensed by the UK Gambling Commission, the leading authority in the industry. You will enjoy a huge game portfolio including table and cards, poker, and live dealer from leading developers like Evolution Gaming, Yggdrasil, Betsoft, Play n Go, Playson and many others. Each game is tested by and independent testing company to ensure that the random number generator software is up to date and the results fair. Our generous welcome bonus of up to $1200 plus 100 free spins is what attracts most gamers to our site. Feel free to contact our customer support agents via email and live chat 24/7.